SeasonScape is an interactive guide to the changing moods of scenic Tasmania. 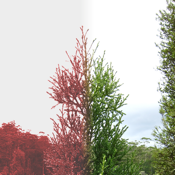 Swipe across each picture to fade between seasons, seeing changes in the trees and animals of the Tasmanian Arboretum. The Tasmanian Arboretum is a park devoted to cultivating trees from across the world. Just inland from Devonport, Tasmania, Australia, it has magnificent growing conditions and is a beautiful place to visit in any season. Or, if you can't visit, relax and play with the pictures in SeasonScape Arboretum.